Castlegar Veterinary Hospital is a full-service veterinary medical facility, located in Castlegar, BC. The professional and courteous staff at Castlegar Veterinary Hospital seeks to provide the best possible medical care, surgical care and dental care for their highly-valued patients. We are committed to promoting responsible pet ownership, preventative health care and health-related educational opportunities for our clients. Castlegar Veterinary Hospital strives to offer excellence in veterinary care to Castlegar and surrounding areas. Please take a moment to contact us today, to learn more about our veterinary practice and to find out more information about how Castlegar Veterinary Hospital can serve the needs of you and your cherished pet. Dr. Dennison grew up in Hope, British Columbia. As a child, she had compassion for all kinds of animals and aspired to become a veterinarian. 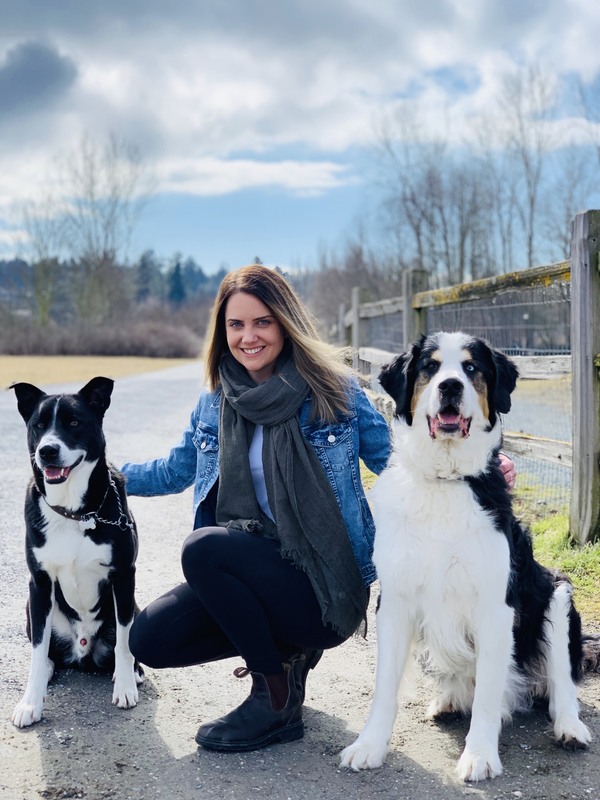 She attended pre-veterinary courses at the University of Victoria before being accepted for the four year DVM program at Western College of Veterinary Medicine (WCVM). She graduated with distinction in 1997. From there, she practiced in Calgary at a multi-doctor practice,and then became a locum ("traveling") veterinarian in British Columbia and Alberta. 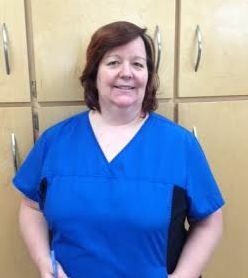 In 2000, she made the decision to purchase Castlegar Veterinary Hospital from Dr. Williams. Dr. Dennison finds all aspects of veterinary medicine to be rewarding, but especially enjoys helping owners understand how to best care for their furry, feathered or scaled companions. Dr. Dennison's love of animals has brought care and compassion to all her patients, clients and staff members and it shows. She has a special interest in dentistry and geriatric medicine. Castlegar Veterinary Hospital has been providing veterinary services to Castlegar residents for over 30 years. 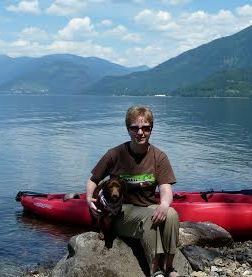 In her spare time, Dr. Dennison enjoys needlework, beading, baking, hiking, kayaking and skiing. She and her husband Albert are happy pet parents to a crazy cat named Rookie and 2 lovable dogs named Xtra and PeeWee. Dr. Ayers was born in Pemberton, but has since moved all over BC including Lillooet, Powell River Williams Lake, and Prince George. She loves the Kootenays because it reminds her of Pemberton with the mountains, lakes and snowy winters…. without all the traffic! She received her BSc in Chemistry from UNBC in Prince George in 2008, DVM from the WCVM in Saskatoon in 2014. Graduated with the Vandi Award for Excellence in Equine Care and Patient Advocacy (the latter being something that she is pretty passionate about). 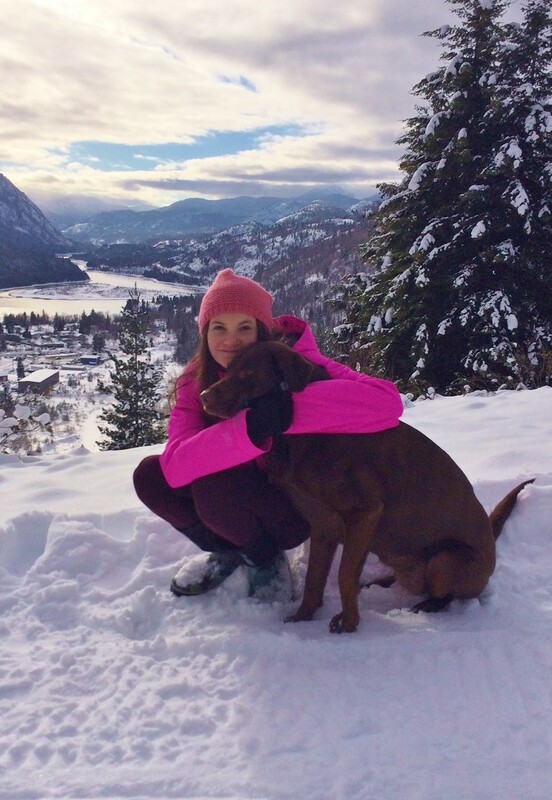 She has been practicing veterinary medicine for 5 years now, 1 year in Cranbrook and then 4 years in Nelson. Dr. Ayers is excited to welcome new patients and clients to continue providing a high standard of medicine and surgery. She lives with her partner Ryan and 4 cats; 9-year old brothers “Link” and “Zedd”, 4-year old “Sailor”, 2-year old Mexican street cat “Pinto” that she rescued on her last vacation there; as well as their 2 dogs; 6-year old Bernese/Great Pyrenese mix “Axel” , 4-year old Kootenay mix “Noah” and “Summer” her 6-year-old QH mare. Dr. Ayers enjoys all aspects of practicing veterinary medicine but what she really loves is surgery! “A chance to cut is a chance to cure!” She is always looking to refine and expand her surgical skills whether it is a routine ovariohysterectomy, an emergency foreign body enterotomy, or a diagnostic skin mass removal. When she’s not at work she enjoys riding her horse, hiking and camping with Ryan and their dogs, riding the quad and snowmobiling with Ryan’s family. When she’s at home, she loves to read with a cat (or two… or four) in her lap. Ashlyn started working here in high school in our student kennel assistant position. She always had an interest in working with animals and has never been able to imagine doing anything else. She applied to us through a work experience class and fell in love with the job. After graduating from Stanley Humphries in 2010, she attended the Thompson Rivers University Veterinary Technology Program. 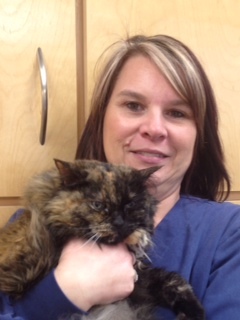 She continued to work here for summers and has returned to us as a full fledged veterinary technician. Her job involves patient handling, laboratory work, radiology, surgical assisting, client communication and computer work. She is seen often helping in the exam rooms, but spends much of her time behind the scenes caring for your furry and four legged companions. Ashlyn lives in Castlegar with her crazy cat "Chip". She grew up in Castlegar. Rachel started working here as a receptionist in 2005. She has since become Practice Manager and can be found helping in all areas of the hospital. Rachel was born and raised in the area, and after graduating high school, she spent some time as a nanny in England. Shortly after returning home, she saw the opportunity to work in a field she loves and hasn't turned back. Rachel and her husband Chad have 2 very energetic and extremely entertaining daughters, Alexa and Liviana. They also have an 11 year old Boston terrier "Tyce". "Every day is a learning and rewarding experience, there is nothing better than knowing what you do helps our patients live a more comfortable, longer, healthy life!" When she's not working, she loves spending time with her friends and family whether it's dinner get togethers, playdates, boating and most outdoor activities. In her quiet time she enjoys curling up on the couch to read or watch a movie. Brenda has been a receptionist here for 8 years, but she can be found helping around in all areas of the hospital. She has grown up in Castlegar and graduated from Stanley Humphries Secondary School. After working for 25 years at the same job she was looking for a change, her daughter Ashlyn was working as a Kennel assistant with us and suggested she apply for our receptionist position! Brenda has been married to her husband Len for 28 years; they have 2 daughters, Kailee, and Ashlyn as well as a 17 year old lovable cat "Prissy". "I enjoy working with the animals and our friendly clients!" In her down time, Brenda enjoys scrapbooking, reading and traveling. Deanne has been a part of our team since 2011, and you can always count on her smiling face at our reception desk, or on the other side of your phone call. Deanne believed this would be an interesting job and became intrigued to apply as she was in the middle of moving to Trail from Salmon Arm. She has been married to her husband for 27 years and they have 2 children. Due to a busy schedule with her boys, they have no pets at the current time but can foresee some furry loved ones in the future. "I can honestly say working here, there is never a dull moment!" Deanne likes to garden and scrapbook in her very small amount of spare time as well as doing Embroidery Digitizing. She is also a "Mom Taxi" to every event her children are involved in, being hockey and racing all over North America!! Natasha would be found in several areas around the hospital assisting with patient care. Most often you will see her assisting the doctor in the exam rooms or helping with medical treatment. Natasha has been at the hospital since Aug 2015 and has a love of all animals. She has been enjoying working here and learning about animal health, medicines and treatments. On her time off, Natasha likes to hike, ride her ATV , Fish, Roller Derby or just be out on the water. As she just moved here from North Vancouver BC some of her travels have been getting to know the area. Her dog ‘Tucker’ (photo) and her cat ‘Pekoe’ both live in Vancouver currently and she hopes someday can come here to live. But for now Natasha has a new little puppy "Talulah" who is a great joy and filling her days! 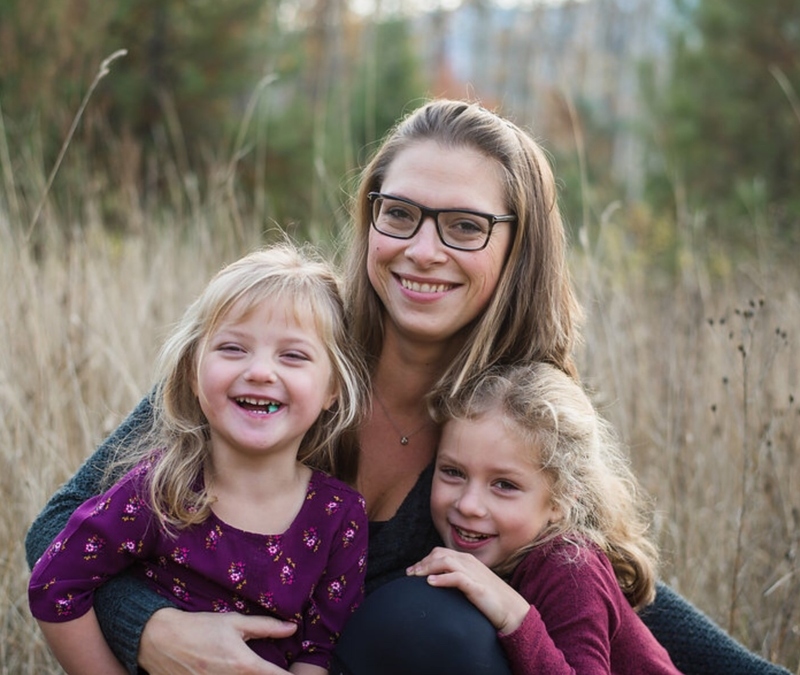 Natasha comes to us with previous experience working as a Veterinary Assistant along with her Veterinary Office Assistant Diploma from Grandville College and her Business Certificate from Capilano University. She wishes to continue to learn about animal medicine and health and is currently in her second year of schooling to become a Registered Animal Health Technician. Carrie can be found in all areas of the hospital, from feeding, walking, caring for boarding/hospitalized patients, to assisting with monitoring surgeries, helping to maintain equipment and so much more! 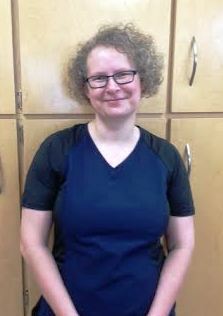 She worked at the Trail BCSPCA for 4 ½ years and decided that she loved working with animals and wanted to further her knowledge on how to keep them healthy and help them when they are not. Carrie grew up in Edmonton and Calgary, AB. Her and her husband Ken have been together for over 20 years and married for over 10. They have 3 wonderfully challenging senior cats, Mynx (12yrs), Pepper(13yrs) and Nella (16yrs). I started in August of 2016 and can be found mostly in the exam rooms assisting the doctor with her patients, and all over the hospital cleaning and giving all the animals TLC ! I grew up and Graduated from High School in Salmon Arm BC and then travelled through Southeast Asia and Australia. I plan to further my education , possibly as a Veterinary technician in the near future as I have found this to be my dream job to work in a vet hospital. My boyfriend Cody and I live in Robson with the love of our lives Jack ! 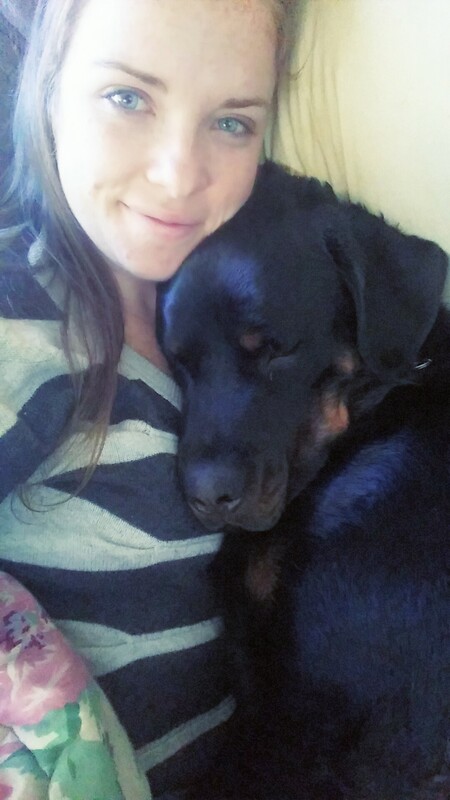 He is a 3 year old Rottie full of so much energy and love. We travel in the off time home to visit family and friends or stay here and fix up the house, work on projects or read. "I just find everything that goes on here at the vet hospital fascinating. Everyone is so amazing at teaching and explaining how everything works. I enjoy being part of the team !" Kady has been working at the Castlegar Veterinary Hospital since May, 2017. She can be found walking, feeding, cleaning and caring for the animals. Kady is a highschool student who goes to JL Crowe Secondary School and is currently in grade 12. She lives in Genelle with her parents, her older brother Tommy, and her 8 year old chocolate lab Calla. Her older sister Alannah is attending University. Kady was born in Lethbridge, Alberta, but shortly after her birth her family moved back to the area to be closer to family. She plans to pursue postsecondary education in a field that will lead her towards working with animals. In her spare time, Kady plays sports but her favorite is hockey. Her favourite memory from hockey was when her and her team came 1st in the Junior Women's Bantam tournament in the Olympic arena in Calgary and Hayley Wickenheiser presented the gold medals. She also enjoys listening to music and most importantly being with her fur baby! Kailey was born and raised in Williams Lake. Just after high school she stared working for Pet Valu and managed the store until moving to Castlegar in 2017. She has been with her fiancé Dylan for 5 ½ years and they have 2 affectional and ball-loving labs, Cypress and Kazia. “I love that there is always something new and interesting to learn here and that I go home everyday feeling good about what I’ve done. Working with animals is truly the best career I could imagine. " When not at work her favorite things to do are camping, hiking and pretty much anything else she can enjoy outdoors with her friends and dogs. Other things she enjoys doing are baking, crafting and reading.